In the USA, 76% of people believe that the evening meal is the most important moment for bringing their family together. Furthermore 72% of kids feel closer to their parents when they have dinner together. However, one person in four says that they cannot manage to enjoy this moment convivially. Barilla is on a mission to bring families back to the dinner table and the Group wants to provide tips and tools useful for families with a digital campaign, a viral video and educational projects. Starting with the belief that a good meal, in line with the Mediterranean Model, should be eaten together with others. The project’s objective is to inspire, motivate and support American families in reinstating the traditional evening meal, thus contributing to their wellbeing. Barilla, as the pasta market leader with strong Italian roots, has a key role in nudging people to adopt right food habits in line with the Mediterranean Model, considered one of the healthiest food model and a UNESCO heritage. EXECUTION: Through the website www.sharethetable.com, an information campaign was launched based on suggestions which, for Barilla, are at the heart of a convivial evening meal. As well as the campaign, the project was diffused on social media through blog channels and nutritionists. 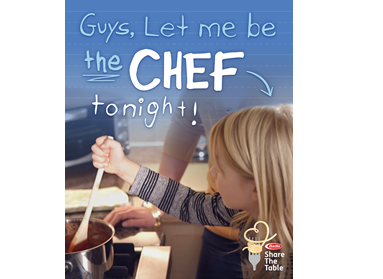 A lot of fun tools (modern cookbooks, placemat creator…) have been developed to “involve” kids in the kitchen and provide nudges to arrange family dinners with adults and children. In this case, with a simple tool, a placemat creation, Barilla “nudges” young children to spend time in the kitchen and, afterwards, to prepare their table and to invite their parents to join it. With this simple tool, Barilla wants to modify the current children’s attitude to “leave the kitchen” or the table, transforming the moment of dinner into a fun occasion.